DELL POWEREDGE R720xd SERVER 24 BAY SFF SIX CORE XEON E5-2620 32GB RAID H710. INTEL 6 CORE XEON E5-2620 2GHZ 7.2 GT/s 15MB PROCESSOR. DELL PERC H710 6Gb/s SAS SATA RAID CONTROLLER. 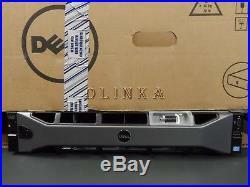 DELL QUAD PORT 1GBE BASE-T. 24 X 2.5 BAYS. SINGLE HOT SWAP POWER SUPPLY. Picture is a stock photo and not for the actual item that you will receive. A hyper-dense 2-socket, 2U rack server, the Dell PowerEdge R720xd has a large memory footprint and impressive I/O options that make it an exceptional platform for space-sensitive environments. Intel xeon processor E5-2600 product family. Up to 768GB (24 DIMM slots/12 per processor): 1GB/2GB/4GB/8GB DDR3 800, 1066 or 1333 MHz. Two x16 full-length, full-height One x8 full-length, full-height Three x8 half-length, half-height. IDRAC7 with Lifecycle Controller iDRAC7 Express (default), iDRAC7 Enterprise (upgrade option) 8GB or 16GB vFlash media (upgrade options). Up to twenty-six 2.5 drives or up to twelve 3.5 drives plus two 2.5 drives. Hot-plug hard drive options: 2.5 SAS SSD, SATA SSD, SAS (15K, 10K), nearline SAS (7.2K), SATA (7.2K) 3.5 SAS (15K), nearline SAS (7.2K), SATA (7.2K) Self-encrypting drives available. Broadcom 5720 Quad Port 1GbE BASE-T (no TOE or iSCSI offload) Intel I350 Quad Port 1GbE BASE-T (no TOE or iSCSI offload) Intel X540 Dual Port 10GbE BASE-T with 2 x 1GbE (FCoE capability enabled on the 10GbE ports) Broadcom 57800S Dual Port 10GbE Base-T with 2 x 1GbE TOE and iSCSI offload available on 10GbE ports Broadcom 57800S Dual Port 10GbE SFP+ with 2 x 1GbE TOE and iSCSI offload available on 10GbE ports. Auto-ranging Titanium efficiency, hot-plug redundant 750W AC power supply; Auto-ranging Platinum efficiency, hot-plug redundant 495W, 750W or 1100W AC power supply; 1100W DC power supply. PMI 2.0 compliant Dell OpenManage Essentials and Dell Management Console Dell OpenManage Power Center. Dell OpenManage Integration Suite for Microsoft System Center Dell plug-in for VMware vCenter HP Operations Manager, IBM Tivoli Netcool, and CA Network and Systems Management. ReadyRails II sliding rails for tool-less mounting in 4-post racks with square or unthreaded round holes or tooled mounting in 4-post threaded hole racks, with support for optional tool-less cable management arm. ReadyRails static rails for tool-less mounting in 4-post racks with square or unthreaded round holes or tooled mounting in 4-post threaded and 2-post (Telco) racks. Microsoft Windows Server 2012 Microsoft Windows Server 2008 R2 SP1, x64 (includes Hyper-V v2) Microsoft Windows Small Business Server 2011 Novell SUSE Linux Enterprise Server Red Hat Enterprise Linux Virtualization options: Citrix XenServer VMware vSphere including ESX and ESXi Red Hat Enterprise Virtualization. 2U RACK 26.80" X 17.44" X 3.40. We keep track of serial numbers on every item we sell. There is no exceptions to this policy. Please test all items upon arrival and report any issues immediately. International customers are always welcome! We are not responsible for this delay. Such requests will be denied. We value the feedback system and we take it very seriously. We are human after all and no one is perfect. We will work with you to resolve any issues you are having. We reserve the right to refuse service to anyone that does not comply with our terms. Olinka is a small company that is specialized in providing IT solutions to individuals and small businesses. We specialize in Dell servers and parts. We tailor our services to fit your needs. All servers can be customized to fit your project and budget. With us, you just pay for what you need. We are ready to assist you with any IT questions you might have. Our IT staff is highly trained on almost all the hardware we sell. Our prices are very competitive, and we take pride in our customer service. If you have any questions or comments, we are delighted to hear from you. The item "DELL POWEREDGE R720xd SERVER 24 BAY SFF SIX CORE XEON E5-2620 32GB RAID H710" is in sale since Thursday, February 26, 2015. This item is in the category "Computers/Tablets & Networking\Enterprise Networking, Servers\Servers, Clients & Terminals\Servers". The seller is "olinkatronics" and is located in Anna, Texas. This item can be shipped to North, South, or Latin America, all countries in Europe, all countries in continental Asia, Australia.